, back when Jamie was a cook rather than a moral crusader. A fish pie is well suited to this time of year, when the weather can’t really decide if it’s going to be warm or cold. Fish pie has that comforting feel to it, but it’s not as heavy as something distinctly wintry involving lots of beef and hours of cooking. Next month for that. Start by peeling potatoes. Lots of them, enough for a good thick topping on whatever dish you’ve got in mind. Gently boil until tender, then mash with some milk or butter. A potato ricer is invaluable here. We should all be energy conscious, so it’s a good idea to steam a couple of handfuls of spinach over the potatoes, and add at least three eggs to the water to hard boil. Jamie calls for two eggs, I use four. I like eggs. Chop an onion and a large carrot into small dice and fry in olive oil or butter until soft and just starting to turn colour. When you’re happy with the carrots and onions, turn the heat down and add about 300ml of double cream, a good couple of handfuls of grated mature Cheddar cheese, a heaped teaspoon of English mustard, salt, pepper and the juice of half a lemon. Taste and adjust the seasoning. Don’t be afraid to use the other half of the lemon (the recipe uses the juice of a whole lemon, but I’ve learnt to be careful). Squeeze the excess water from the spinach and peel and halve the eggs. In your chosen dish, arrange about 500g of white fish, chopped into chunks. I used coley, and some seafood I had in the freezer, a superb mix of prawns, mussels and squid. Any type of fish or seafood will really do, as long as there’s a decent base of solid white fish in there. Some salmon would be excellent. Add the spinach and eggs to the fish and pour over the creamy vegetable sauce. Spread mashed potato over the top and make some patterns on the top with a fork. Go on, be creative. Jamie counsels against piping the potato – I’m with him on this. Piping has no place in a normal kitchen. Bake in a hot oven for about half an hour. The contents will bubble over the side of the dish, so put it on a baking sheet. 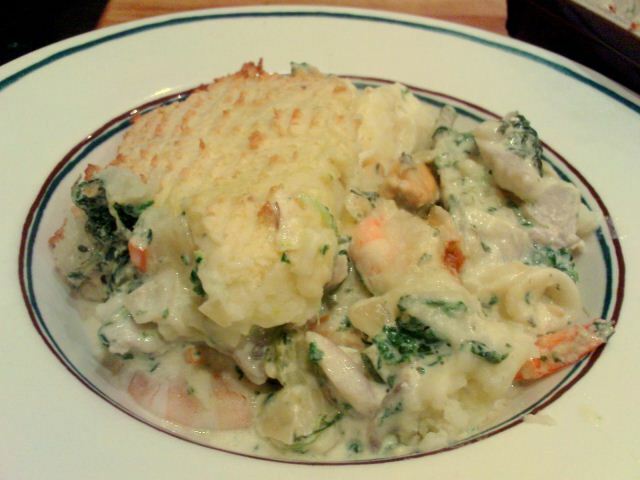 There are more sophisticated recipes for fish pie than this, but this one is easy and fairly quick to put together. The mustard and lemon in the sauce balance the richness of the cream. A homely and satisfying dinner.